Champagne was not discovered in Champagne! Sorry to burst your bubble but it’s the truth. This month our French #Winophiles group is exploring Champagne, a beverage that elicits strong reactions and thoughts. It’s more than just an elegant drink for special occasions. Like wine, it’s something to enjoy often with a wide variety of foods. It was the year 1531 and those monks in Saint Hilaire, near Carcassonne in the Languedoc, knew they had something. That something was Blanquette de Limoux and it happened quite by accident about 150 years before bubbles surfaced in Champagne. They discovered a “sparkling” wine after some white wine had a re-started fermentation in a flask. Some suggest Dom Pérignon made the discovery, but it’s questionable on several accounts. Other historical papers indicate the Romans enjoyed spontaneous bubbles. English scientist Christopher Merret officially documented the process. He demonstrated adding sugar to wine in a bottle then sealing it resulted in a second fermentation, which produced bubbles when opened. It’s what we know today as méthode champenoise, the traditional method. So how’s this beverage made, the only beverage in the world that can state “Méthode Champenoise” on its label? All Champagne grapes are manually harvested (younger with more acid), into small crates to keep clusters whole and berries undamaged until arrival at the press. Why? Two of the three primary grapes are red: Pinot Noir and Pinot Meunier. Historically a wider, shallower press was used (the coquard basket ). This meant less skin contact as the first juice left the press keeping color to a minimum. These days pneumatic presses are used for the same reason. 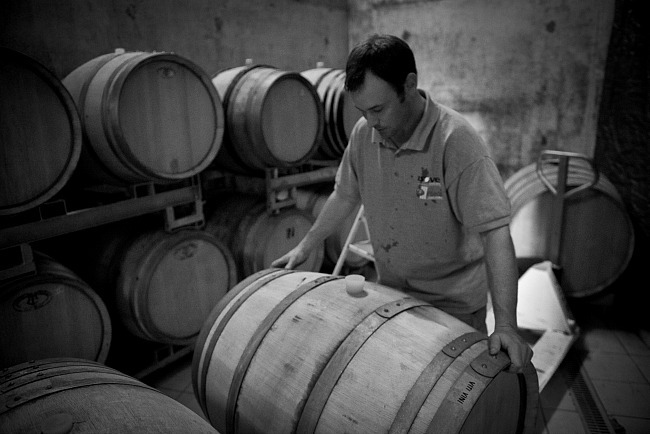 The first juice, a clearer free run known as “cuvée”, is kept separate from the darker “taille”, the tail end or last juice which contains impurities due to the gradual greater pressure exerted during pressing. Once you’ve got your juice, the process starts! 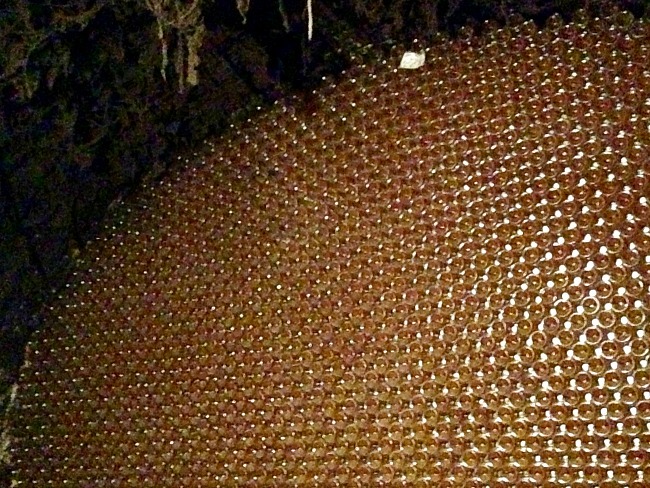 Although you have your clearer “cuvée”, it still contains impurities that are removed before the first fermentation. “Debourbage” is a settling / filtration process where these particles sink to the bottom of the vat allowing removal of the juice above. Fermentation follows with different grape varieties and vineyard lots fermented separately in stainless steel vats. Fermenting in oak is not common. Blending is a detailed process where several to hundreds of cuvée are tasted to determine the blend for a particular champagne. 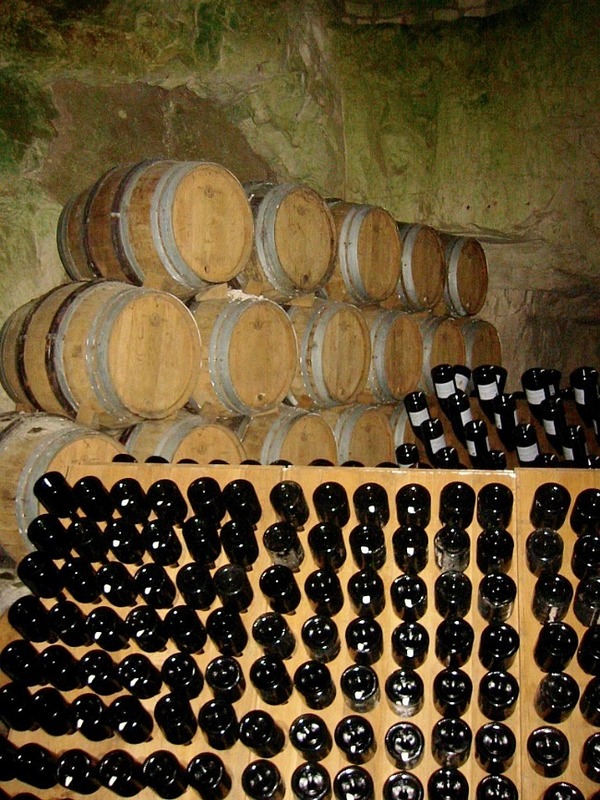 The “liqueur de tirage” (a sugar and yeast solution) is added to the wine, which is then bottled, topped with crown caps, and placed in a cellar. The wine ages on its lees (dead yeast particles) for a minimum of 15 months for non-vintage, or 36 months for vintage Champagne. During this time it develops what are known as autolytic aromas and flavors, and a richer, creamier mouth feel with greater complexity. Typical autolytic aromas include brioche, toasted nuts and grains, yeasty bread, buttermilk, and elderflower. The bottles are twisted (over the course of 3 weeks traditionally by hand or by Gyropalette machine for 1 week) eventually finishing in a vertical position neck down with all lees in the neck. Notice in this picture the bottles in the front riddling rack are not as advanced as those in the rear rack. You can see how bottles in the rear rack are more vertical, thus closer to disgorgement. The bottlenecks are dipped in a solution, freezing them. Caps are taken off momentarily allowing pressure in the bottle to pop out the frozen solution containing the lees. The bottles are topped up with a sugar / wine mixture called the “Liquor d’Exposition”. The amount of sugar in this mixture, referred to as the “dosage”, depends on the style of Champagne being made. Finally, bottles are corked, wire cages applied, and off to mature they go. I luckily discovered a vigneron pouring his Champagne thus the pleasure of tasting and discussing each bottle was his. 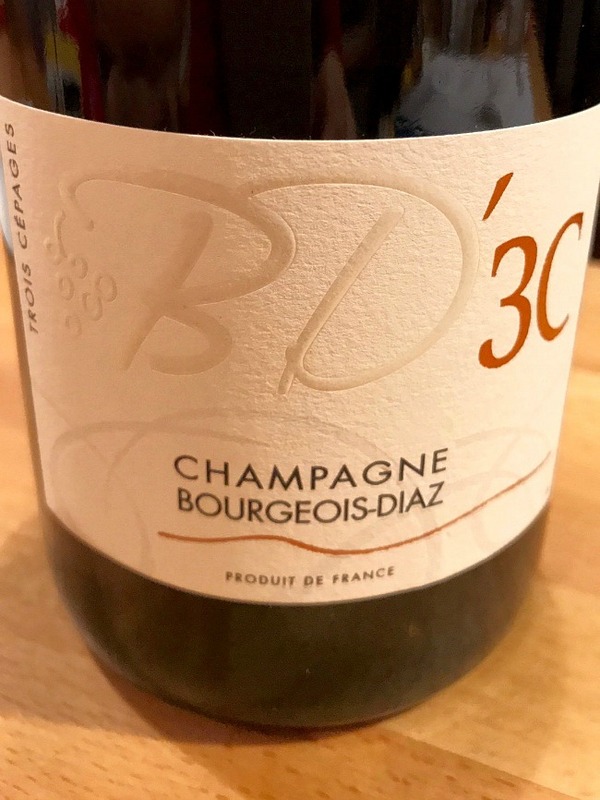 Small but making stellar bubbles, Champagne Bourgeois-Diaz is located in the Vallée de la Marne in the northwestern edge of Champagne. 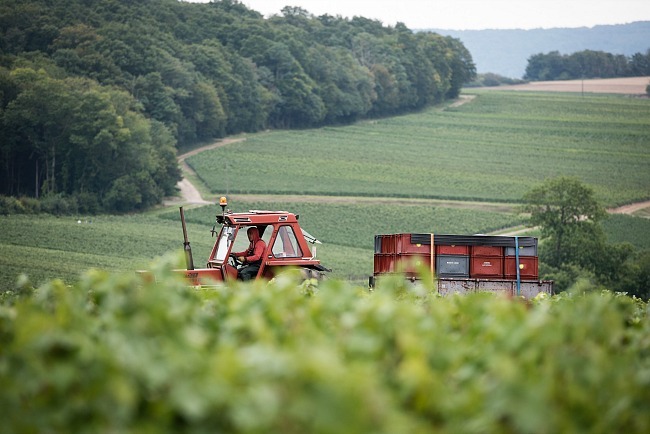 Jerome organically farms 17 acres of vine plots in the village of Crouttes-sur-Marne and its environs. He ceased using herbicides in 2010 choosing to convert to biodynamic agriculture. 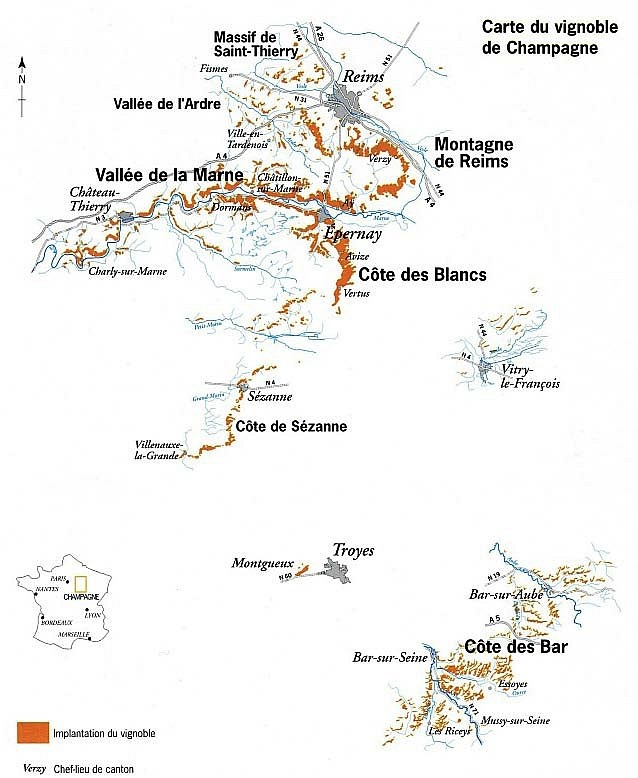 Planted on mostly clay and limestone soils, the vines average 35 years of age, overlooking the Marne River with southwesterly slope aspect. Farming organically in this area poses difficulties due to heightened humidity from the river; that humidity causes mold and rot. Jerome uses a traditional shallow press followed by primary fermentation in either stainless vats or old barrels with indigenous yeasts. He avoids sulfur and other additives with an aim of producing harmonious, terroir expressive Champagne with vintage variation. He and his family have their own vineyards, grow their own grapes and make their own Champagne, thus are considered a “Grower Champagne”. You can find some of these bottles in the US, prices ranging between $20 and $50. Final Thoughts: Lovely, with complexity for a lively discussion. The dosage (amount of sugar solution added after disgorgement to top up bottles) is just 3g/L giving a pure, assertive character. 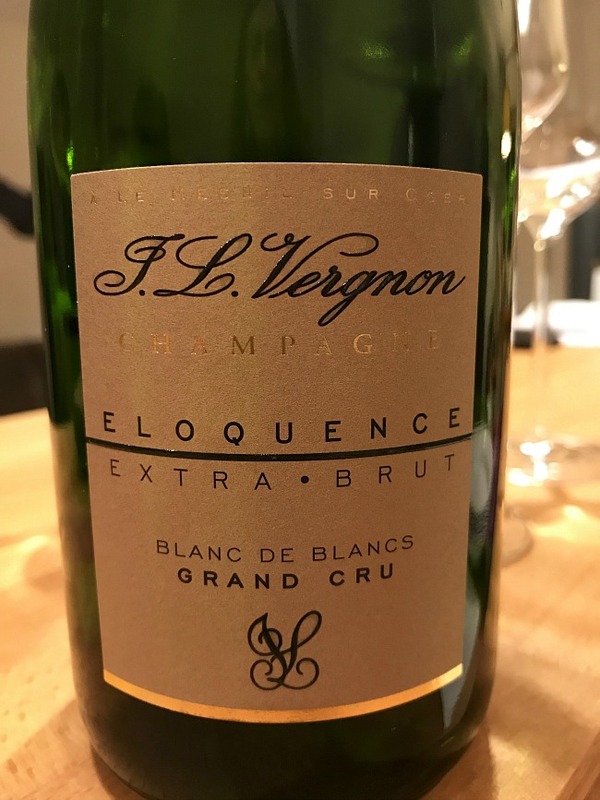 I recommend enjoying this champagne as an aperitif with Salmon Rillettes, or with dinner, try a variety of seafood or white meats. 100% Pinot Meunier vinified with 35% used oak. Final Thoughts: Another 3g/L dosage- a fresh, initially assertive wine that begs for carpaccio, or chicken in mustard sauce. Final Thoughts: Salmon, whether sashimi or grilled is what called to me when tasting this wine. Although like the “3-C”, good for anytime really. I wanted to taste a classic, non-organic Blanc de Blancs for comparison. Champagne J.L. Vergnon is located in Le Mesnil-Sur-Oger, south of Reims in the Côte de Blancs. This bottle is 100% Chardonnay sourced from Grand Cru vineyards and aged 3-years in cellar. Final Thoughts: Fairly classic style, on the delicate side, excellent for an aperitif and with seafood appetizers. Any of these Champagnes are welcome back in my house! Twitter Conversation! – Please join our group for a live Twitter chat all about Champagne Saturday, March 18th at 8:00 am pacific, 11:00 am eastern (17h in France). We’ll be there under the hashtag #Winophiles. Comment, ask questions, and get tips on Champagne, Champagne food pairings, and more! Jane from Always Ravenous examines in her story The Evolving Culture of Champagne. Lauren from The Swirling Dervish writes about The Enduring Allure of Champagne. Camilla from Culinary Adventures of Camilla shares a perspective in Toasting Seventeen years with Moët & Chandon Impérial Brut Champagne. Gwendolyn at Wine Predator writes about Women in Wine: Floriane Eznack, Cellar Master, Champagne Jacquart. Jeff at FoodWineClick! shares Everyday Celebration with Champagne and Curried Shrimp Salad. Martin from ENOFLYZ Wine Blog shares affordable and accessible with Under $30 Vintage Champagne? Oui! Jill Barth from L’Occassion lets us know it’s worth fighting for with Bernard de Nonancourt of Laurent-Perrier: Champagne Résistance Fighter. I don’t think I’ve ever tasted a Champagne that was 100% Pinot Meunier. Now I’m going to have to find some! Wonderful, clear explanation of the process of how Champagne is made helps us to understand why it is so darn expensive! Such a laborious process! Great tasting notes too! Thanks Gwendolyn! 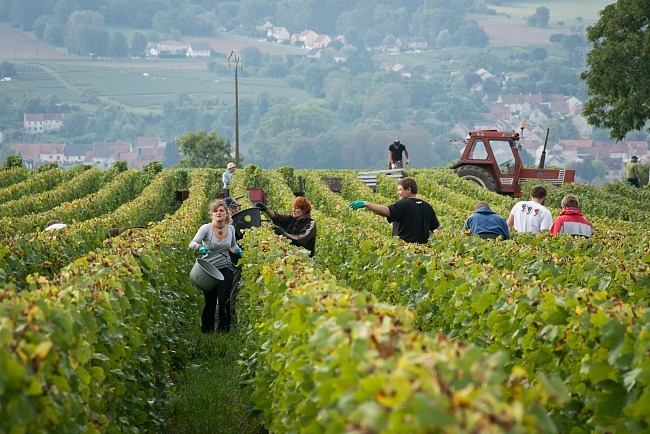 Kudos to all the Champagne producers who endure the process, especially the smaller ones. Seems much easier to go organic or biodynamic in those sunny, mediterranean climates compared to the more continental regions in France. Bravo to Jerome! It certainly does Jeff. I have to hand it to those farming organically in the northern, more difficult areas. Jerome is passionate about it, I could hear it in his voice. A great explanation of how Champagne is crafted. It took me back to my visit to Champagne in 2014! Wonderful post. Looking forward to seeing more! Great post Lynn! I felt (wished) I was right there with you tasting. Is any of Jerome’s Champagne exported to the U.S.? Nice Champagne making process summary too. What a wonderful explainer for all of us — and how cool that you met Jerome. I love it! I’m going to look for his wines and try to follow along with him…very interesting and impressive. I am a fan of Blanquette de Limoux, as well as Champagne so I say bring on all the bubbles! Bourgeois-Diaz is fantastic! A friend of mine introduced me a couple of months ago, and I was really charmed with what I found in the bottle. Good to know that his wines are available at reasonable prices in the US. Oh, it’s liqueur d’expédition, not exposition. I’m going to visit Champagne this fall and was searching for various information planning for my trip. Found your overview of the Champagne making process quite helpful! And I have Bourgeois-Diaz on my list to visit now. Can’t wait! Glad you found the process of making Champagne helpful Martha. Please let us know how you like Bourgeois-Diaz, and have a great trip!